Plywood and OSB (oriented strand board) panels are the natural choice for the environment. Modern manufacturing maximizes product efficiency with less harmful emissions than other products. View the forest management certification status of participating performance panel manufacturers. 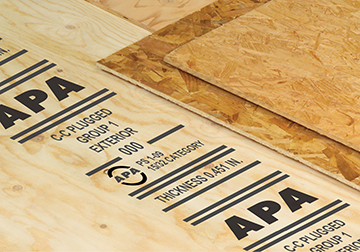 APA Rated Plywood and OSB panels are exempt from U.S. EPA and California formaldehyde regulations due to their very low emission rates. 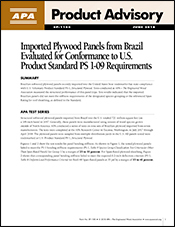 The manufacturing techniques for plywood and OSB Performance Panels minimize natural variation of wood using state-of-the-art quality assurance programs that provide consistency from panel-to-panel. Panels effectively resist both uniform and point loads. Strength is the ability of the panel to resist loads w/o breaking. Stiffness is the ability to resist loads without deflecting too much. For some applications, such as architectural finishes for concrete form, stiffness is in important attribute, otherwise, the concrete will have a pillowed look. Panels remain relatively consistent in size in most environments. Panels can be manufactured with many different surface qualities. Panels can be easily cut into almost any needed shape or size with commonly available tools. Wood's ratio of structural performance to weight easily beats other products. Panels are highly resistant to many chemicals and weather when properly finished or treated with preservatives. Panels can be designed to have puncture- and wear-resistant surfaces. Custom-designed panels can be engineered to meet specialized demands.